I wrote a post a long time ago wherein I found a recipe for silver polish from the Compendium for Cookery (circa 1890) - it's here. I am glad for that recipe, but it is a paste. And you know, with pastes, you must slather and slop and blaggle (I just made that up, but you get the idea) it all over the silver items in all of their nooks and crannies while scrubbing. And your hands have to touch the stuff, which gets you all silvery smelling (do you know what I mean? Its that sort of sulfur smell, sort of unpleasant, but not completely overpowering?) and all dirty. If it is between that recipe and the general run of the mill toxic chemical stuff made in factories and sold to you at your favorite retailer, I will choose the sloppy blaggle every single time - both for the reason of cost (to make a paste it costs about five cents - well, okay, I don't know, but I'm just guessing.) and for the toxic exposure. Oh, my lovely friends. You have to try this. I have something that is homemade, cheap, and you DON'T HAVE TO TOUCH OR SCRUB! Wooo! 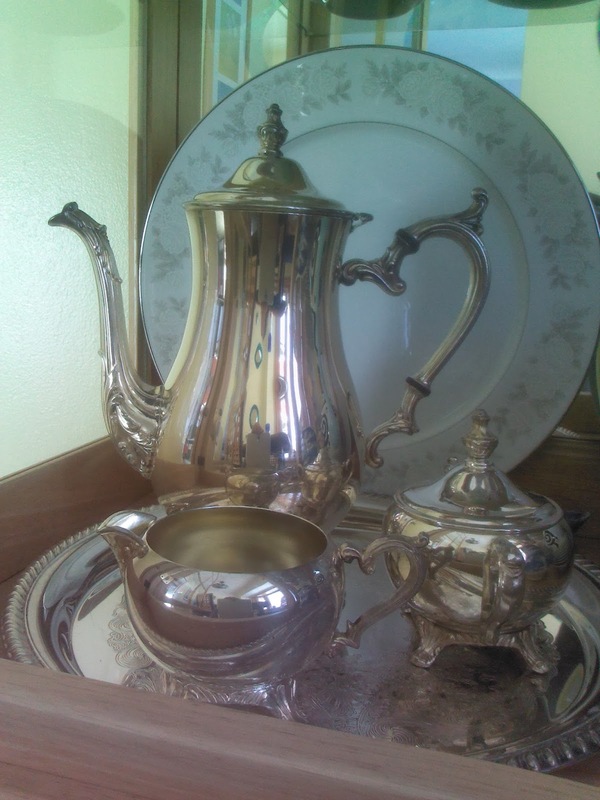 So, I'm having a tea party tonight and I looked at my china cabinet and was like, um yeaaaaaaaaaaaaaaaaah, people are going to be choosing their tea cups today and alas, there, beneath the tea cups, is the silver tea set which looks like it was in a soot fight with Mary Poppin's friend, Bert, who cleans fireplaces. So. I tried to dig out my old paste recipe and didn't have it on a 3x5 card in my handy-dandy 3 ring binder, so I went online. What did I find there, m'dears? A very simple recipe for a silver dip. No, not like you're going to eat the dip with chips, a dip to dip your stuff in. It looked so easy I had to do the science experiment. You need to try this. For real. It's cheap, quick and did I mention there is NO SCRUBBING? I am partial to those kinds of things, especially when I am in a hurry like today. 1. Get your disgusting looking tarnished silver and marvel at how utterly horrid it looks. 2. Fill up your sink with the hottest water you can. Make it deep enough to put your silver items in so that they will be submerged. 3. Put a piece of aluminum foil on the bottom of your sink. I just made it about the size of the sink. 4. Sprinkle salt and baking soda into the cauldron sink. I don't know how much, maybe 2 teaspoons? Maybe 2 tablespoons? Whatever. You don't need to measure. 5. Stir it up with a wooden spoon. 6. Place disgusting looking tarnished silver items in the water. 7. Wait. It may lay in there for up to 5 minutes. 8. Watch as before your very eyes it turns from black to shiny silver. 10. Figure how to get it out of there without touching it (this is a Ms. Daisy thing. I suppose you could touch it, but I don't know how toxic it is. I used tongs to lift it out and the wooden spoon to balance it.). 11. Dry it with some paper towel. 12. Marvel at how shiny it is and you didn't even have to do anything difficult. Wow. Yeay! I believe the last time I actually polished my silver was that last post, so you can imagine that it was quite oxidized. If this is all it takes to clean silver in the future, I may actually be inspired to keep it clean. I had to tell you. Now, go on, try it! Baking Up Deception: Beet Brownies?